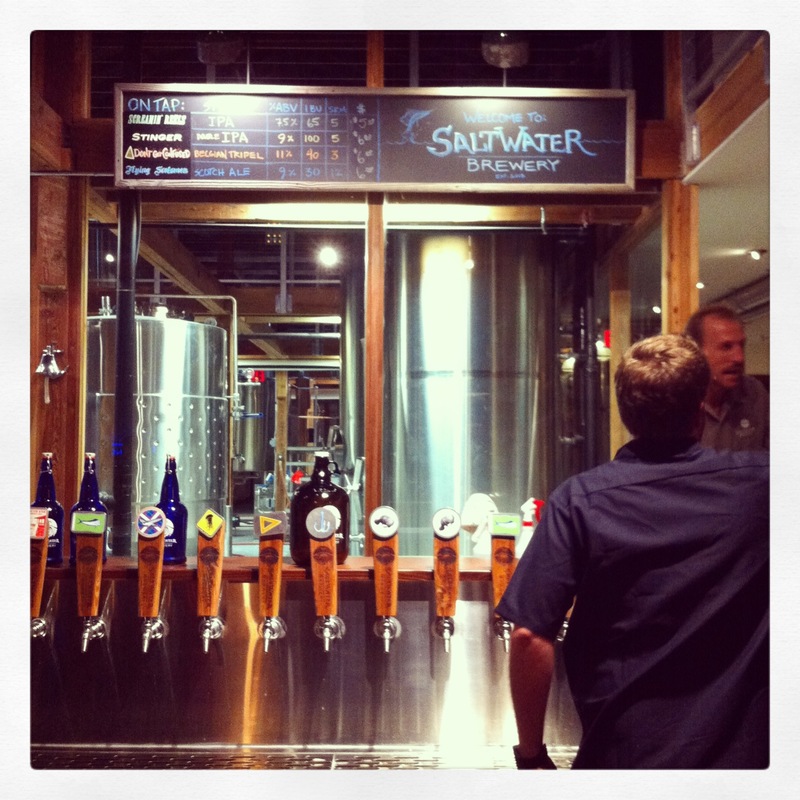 Saltwater Brewery is open for business – and it is everything we wanted it to be and more! It didn’t take too long circling the parking lot to realize that Saltwater is already not hurting for business (not to mention that they’ve been open for less than a week and have 3,500+ likes on Facebook.) The place was packed with people bustling around, checking out the beers and merchandise and lounging at communal tables and high tops. The inside had a long bar with TVs playing college bowl games, a leather lounge area, seating and table shuffleboard while the outside hosted an unexpected beer garden of reclaimed wood tables and standing bar space, complete with corn hole boards – not to mention free wifi and a phone charging station. As opposed to others around us ordering flights to test the (salt)waters, we dove right in ordering pints of each. My favorite of the evening being the South End Sessions Ale. Other favorites at the table included the Big Treble Amber Ale and Don’t Get Confused Belgian Tripel. With a broad range of beers, there is something for everyone and the taproom itself is a sight to behold. Re-purposing the old Delray Beach Farm Supply building, the brewery has a historic and modern feel to it. Glass separates the crowd from the large tanks brewing their very beverages. 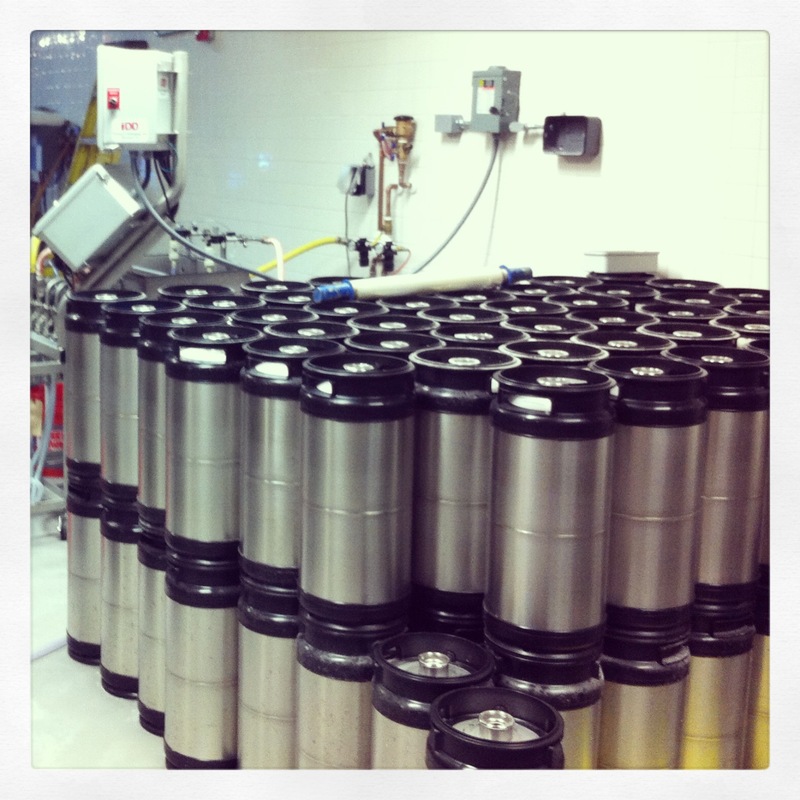 The tanks and stacks of kegs all shine in the bright lights of the barn’s newest tenant. Chairs line the bar where taps each have a small logo indicating which beer it holds (jellyfish for Stinger, manatee for Sea Cow, dolphin for Screamin Reels, etc) and large blackboards chalked with beer names, %ABV and pricing hang above the bar and along the walls. The Saltwater team is made up of family and friends with a collaboration of dreamers, businessmen, brewers and artists to create a powerhouse of knowledge, know-how and passion for beer. And so far, I’d say they’re off to an amazing start. Check out our Spotlight of Bo Eaton, Co-Founder HERE!